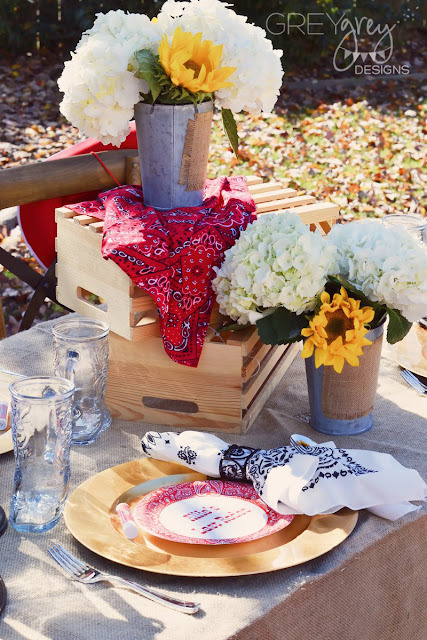 I love a unique spin on a traditional bridal shower. Being from Arkansas, I know plenty of ladies who love their country music, their horses, and their farms. Any event surrounding a wedding should be tailor-made and personalized to be about the bride, don’t you agree? 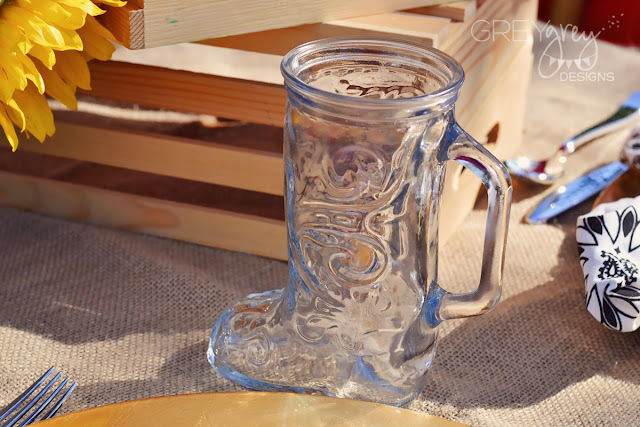 So, if you have a cowgirl in your life (or a girl who loves a cowboy! 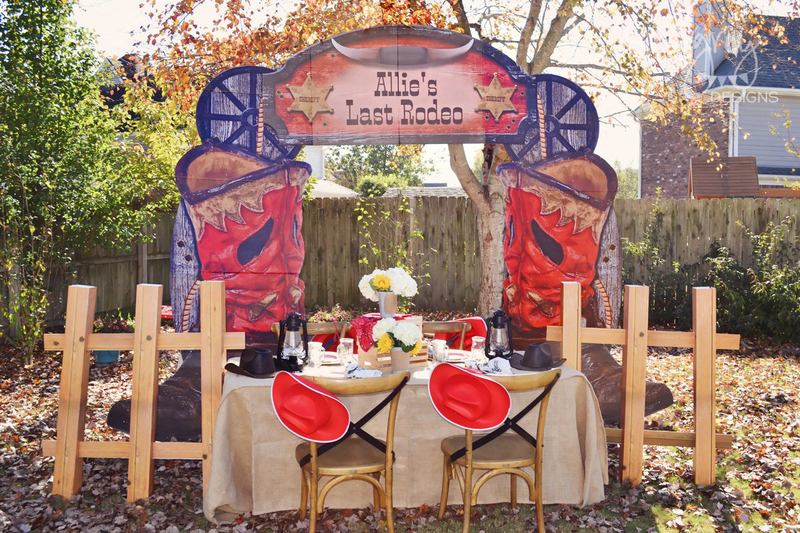 ), why not throw her a “Last Rodeo” Bridal shower? 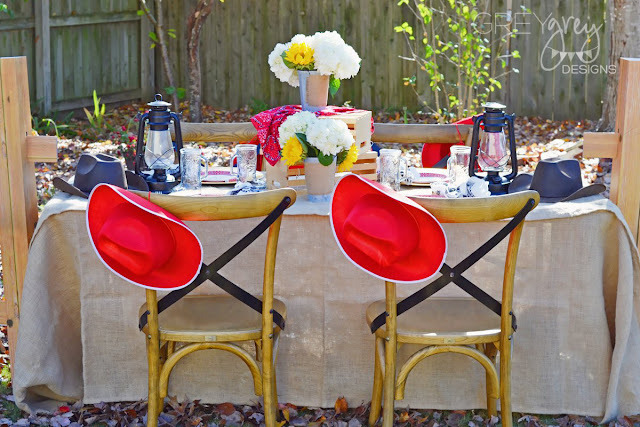 Saddle up for this cute party! The fall is the perfect time to create a Western themed bridal shower in my opinion. The rustic feel of the rodeo coordinates perfectly with the texture of the fallen leaves. So, I set this party up outside, under a beautiful tree that has strewn its leaves all over the ground. 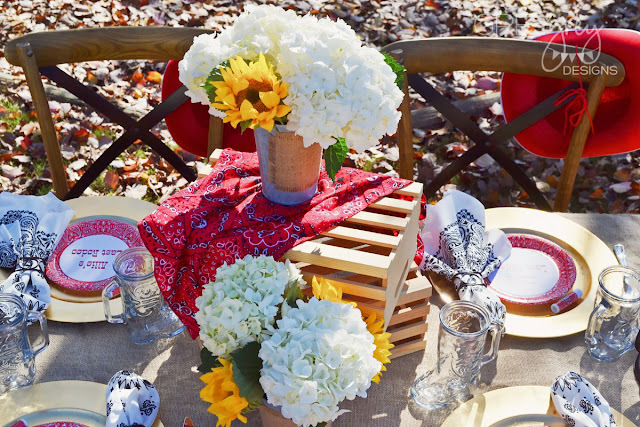 I love combining lots of textures into my parties. 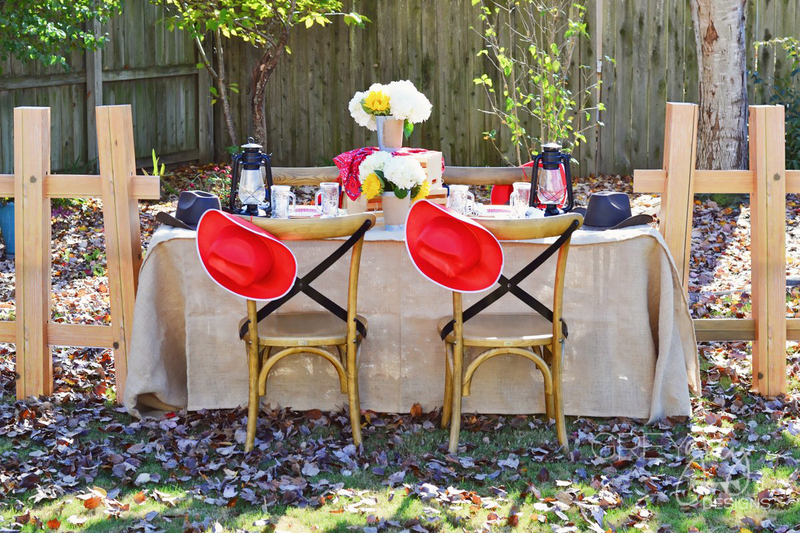 For this one, I started with two burlap table covers, which I then layered to reach the ground on my table. For my chairs, I used a wooden x-back chair, which calls to mind that rustic feel of the rodeo. 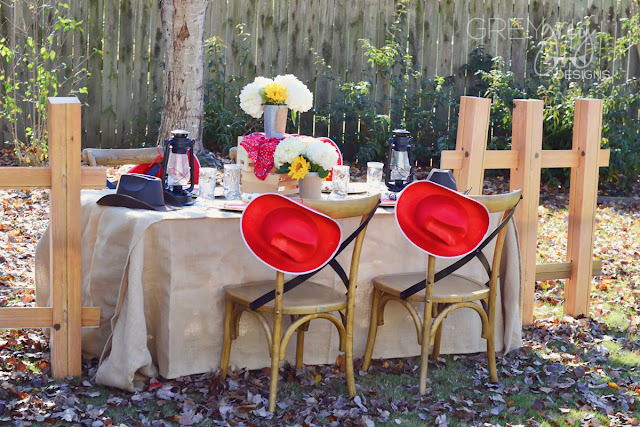 On the back of each chair, I hung these Red Felt Cowboy Hats for the guests. 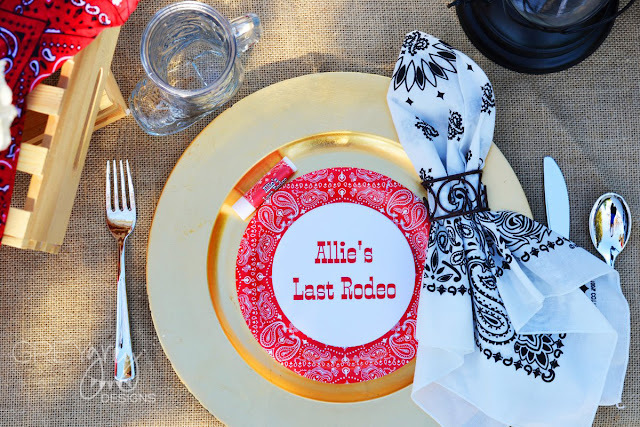 Each place setting started with a simple gold charger. I layered that with these personalized bandana plates. 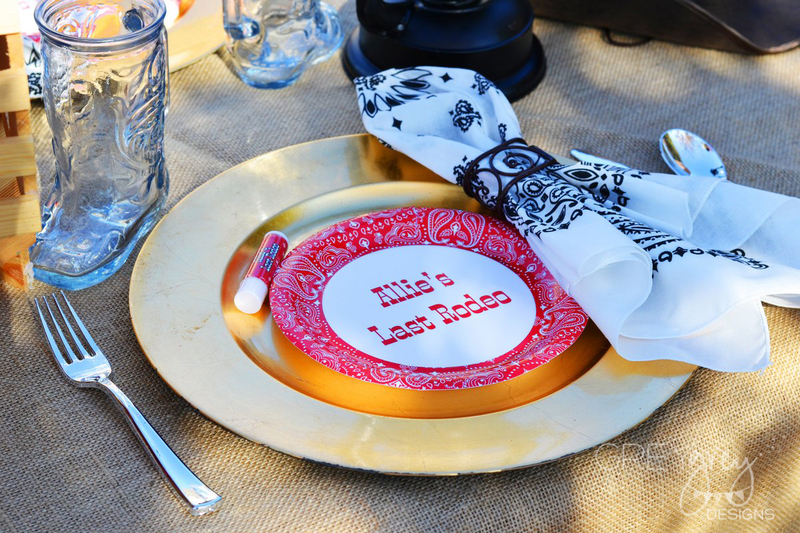 You can also add the bride’s picture to these plates! 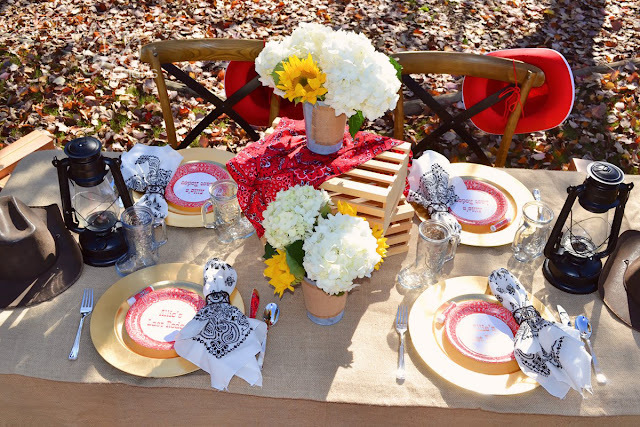 Instead of using a traditional napkin, or a paper napkin, I used white bandanas! A cute metal napkin ring, which reminded me of barbed wire, was the perfect little detail. Instead of traditional glasses, how fun are these Glass Boot Mugs? These are also a great favor idea. 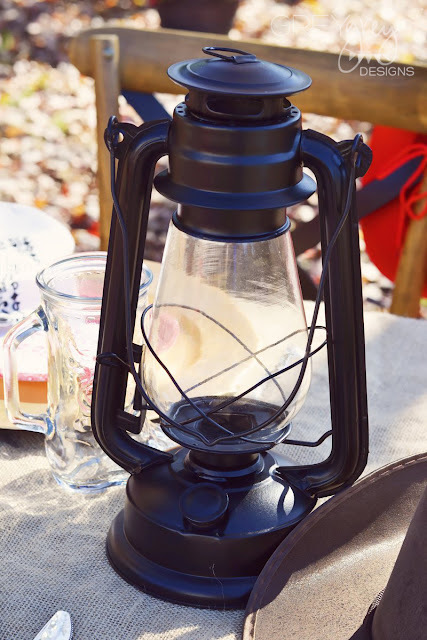 The guests can take them home to remember the event. 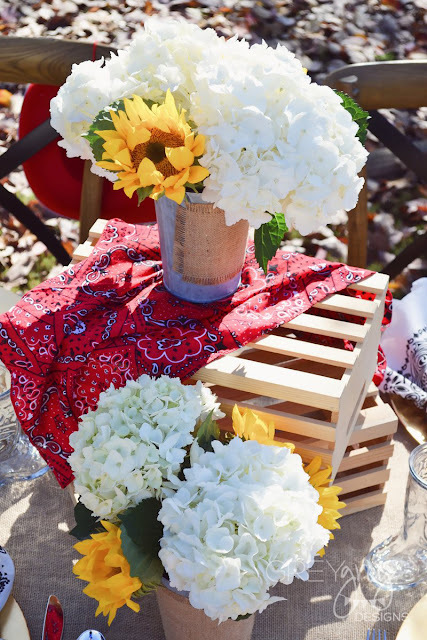 You could even fill the flowers or candy! Each setting also had a personalized lip balm to match the plates. Since this event is for women, I can’t think of a better favor idea! 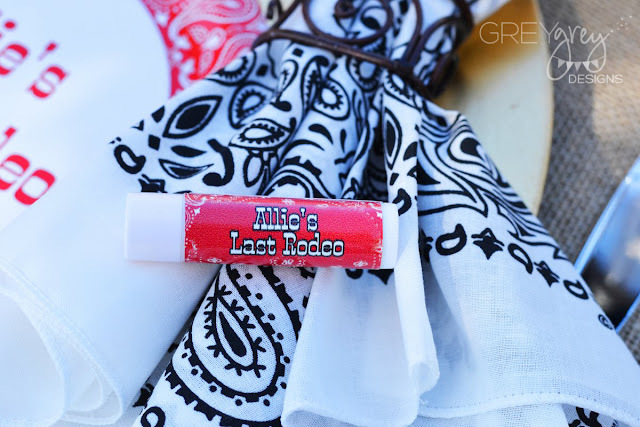 I always have a tube of lip balm with me! For our centerpieces, I chose a few different items. 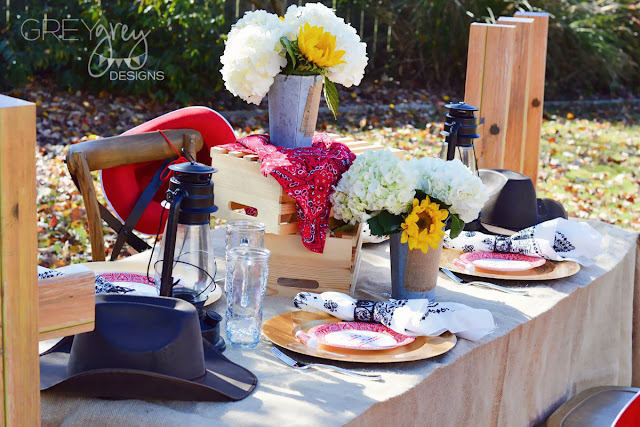 The first were two Burlap Label Metal Planners, which I filled with hydrangeas and sunflowers. These are two of my favorite flowers for events because they are inexpensive and also large, which take up a lot of space in your containers. 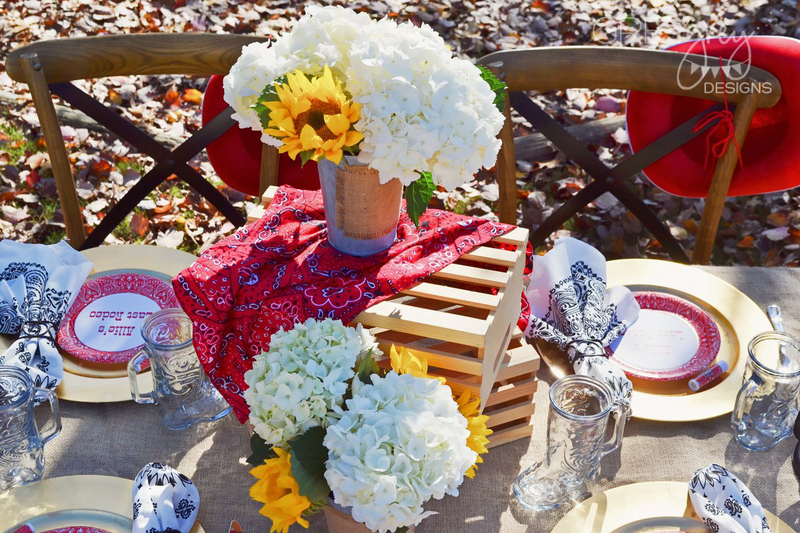 To give some additional elevation, I stacked them on top of a couple of wooden crates, and then added a red bandana. 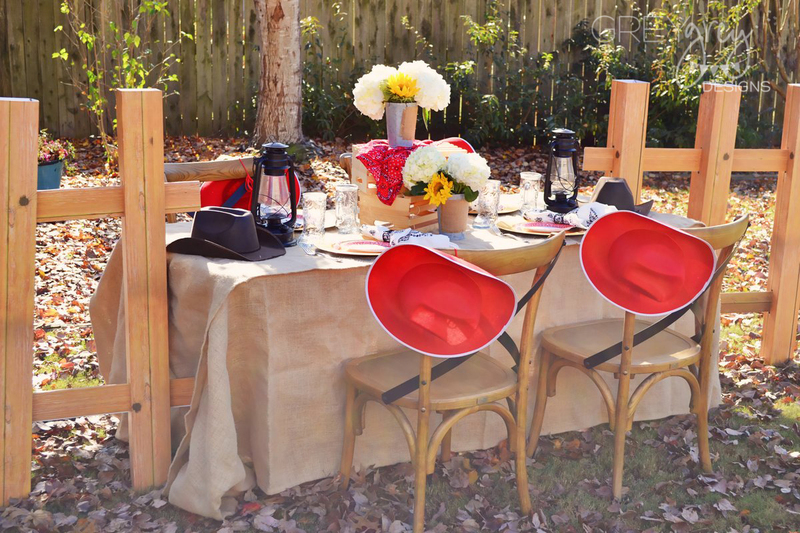 On either side of the table, these Western Lantern centerpieces as well as two Western Hats. 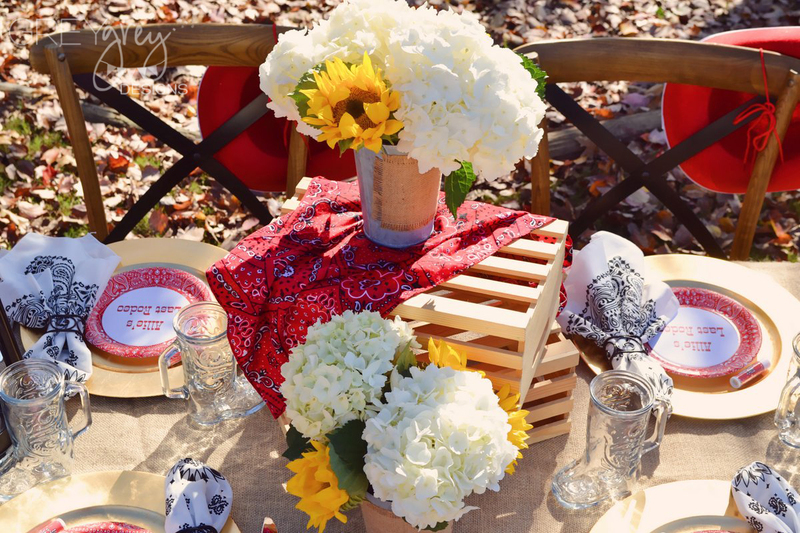 To make it feel like we were on the ranch, these Split Rail Fences were the perfect addition to the table sides. 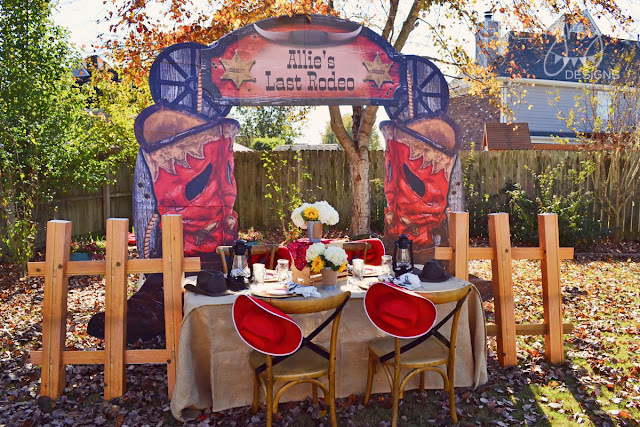 These are a snap to put together and make such a big impact on your event. They are very lightweight and can be moved around for a photo opportunity. And for our BIG impact for this event, I love Western Boot Arch. It’s so great to be able to personalize it with the bride’s name and such a WOW moment for your shower! I hope your next event is a buckle-winner!